I’ve heard that early Taurus guns weren’t very good, have things improved? Thread: I’ve heard that early Taurus guns weren’t very good, have things improved? Ha ha ha! Funny stuff right there! From 2007 no less! Oh, come on! What's a decade or so between friends? taurustoter, glenwolde and Yissnakk like this. My first experience with Taurus was in 2015 when my brother bought a Taurus Judge for Home Defense, which left such a positive impression on me that 2 years later in 2017, I bought one for myself in the Magnum configuration with the 3" Cylinder. However, one negative thing about his Judge was the matte black finish, which was neither durable nor corrosion-resistant seeing as it wore off just from regular handling in under a year which ultimately resulted in him refinishing it with Duracoat, at which point he found a bit of surface rust beneath the grips, so when I bought mine I opted for Stainless Steel. Although I've only owned it for about 9 months now, I've been very pleased with my Judge and haven't regretted my purchase. It's a good Revolver at a great price, and the fit/finish is actually better than some modern Smith & Wessons I've handled due to having a more consistent/even bead-blasted Stainless Steel finish and less sharp edges. 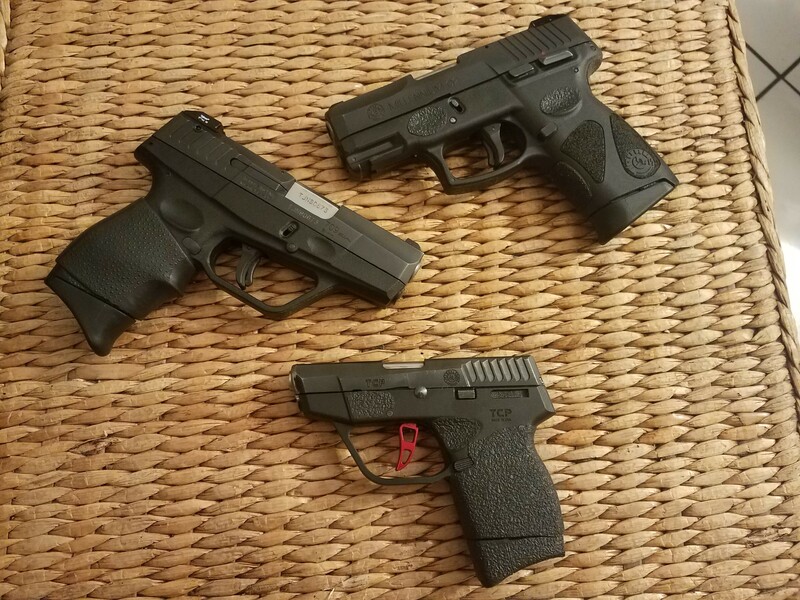 Furthermore, due to the combined positive experiences my brother and I had with Taurus, we went on to buy our parents 3 different Taurus firearms as gifts over the years, (a TCP-738, Rough Rider, and a 605) all of which have been problem-free so far. So far my experiences with Taurus have been positive and trouble-free, although I must admit that I'm a bit leary of purchasing anymore Taurus brand firearms now that they've recently withdrawn their Lifetime Warranty from all their latest firearms produced since 2017, so I'll be interested in seeing the experiences other folks may post in this thread in the future. "If you work for a living, why do you kill yourself working?" - Tuco Remírez - The Good, the Bad, and the Ugly. I like zombie threads. Sometimes I get a "like" on a post I don't even remember. Yissnakk, jtg452, Taurus1965 and 1 others like this. glenwolde and nevadabob like this. "She said her name was Emergency and asked to see my gun....said her telephone number was 911"
very good time to be resurected as Taurus has seemed to have improved reliability. The new G2c has gotten lots of great reviews on the web lately and has got me convinced I need one. I wasn't familiar with Taurus in the 80s but I remember reading about one of their guns in magazine around '87 & they said quality control had gone up. Early '90s I bought a model 85, liked it & bought another for my wife. No problems, shot well. A few years ago I could not find a S&W 66 Plus anywhere, new or used. I got a new Taurus 66 7-round & love it. Way cheaper, great trigger SA or DA, tight lock up & accurate. My wife's house gun when I worked night shift.